Updated July 2018. Compensated affiliate links may used, which means if you make a purchase I receive a small commission at no extra cost to you. I truly appreciate your support toward the costs of running this blog! Read more. Copic Jumpstart Class is the best place to get a major braindump of my Copic knowledge. It’s not only for beginners; it contains lots of instruction about color theory! Colored Pencil Jumpstart Class is an excellent primer for colored pencil artists: color theory, techniques, and more! Bible Journaling 101 is an inexpensive overview of Bibles, mediums, and a basic start….watch all the lessons prior to shopping and it might just save you a bundle. If you want to learn how to turn your ideas into visuals, Seeing the Scriptures is a great start. For all mediums: I highly recommend Drawing 101 prior to ANY intermediate level class. The class was designed to provide basic instruction on forms, perspective, and shading, and your art in future classes will be much more successful if you know a little about drawing first. Watercolor Jumpstart Class will be coming in Fall 2018! Compensated affiliate links may used. Read more. Copic Marker blending recommendations are HERE. Copic Jumpstart Class is the best place to get a major braindump of my Copic knowledge. Storage: the big case that I use has been discontinued. Boo! But note that Copic (and most) markers can be stored horizontally or vertically. Airbrush – see the Get Started post HERE. Colorless Blender for adding texture (apply with textured fabrics etc) or put into a Mini-mister and spritz. Prismacolor are the brand I’ve used since college and love them! Come in 150 c0lors. Polychromos – excellent pigmentation and range of 120 markers. Sharpener: I’ve found THIS one and love it! For travel I use this one. There’s a LONG “Getting started with watercolor” post HERE – with info on papers, brushes and paints. Below is a quick list of favorites, Compensated affiliate links may used. Read more. Daniel Smith – Start with the set of 6 basics, or order one of my dot cards so you can test out a little of each of my colors. You really don’t need a lot of colors if you learn how to mix….stay tuned for a Watercolor Jumpstart Class coming in fall 2018. I’ve put my paints into a palette – see more about how I set mine up HERE. Gansai Tambi. Great buy for crafters who don’t want aninvestment. Good pans for travel and everyday use are the Koi. I took these and others to Europe with me in 2015 and they were the best for that trip! Pricey small travel pan sets: W&N and Holbein – In all honesty I don’t use these much except if traveling. Dr PhMartin Hydrus – intense and delicious, my fave brand of these. They come in three sets of 12 bottles, no duplicates between them. They dry permanently – which means you can layer over them without “lifting” color you’ve already put down, as long as you wait til it’s completely dry. These are the best “deal” per ounce of liquid watercolors listed here. Pinkfresh – best color selection out of these last three. Hardbord for taping down paper, though I do that less and less of late. Regular old masking tape. 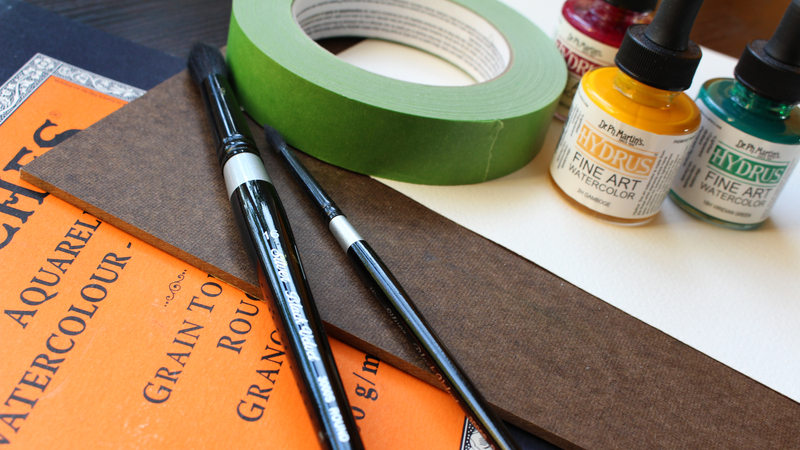 Grumbacher Masking Fluid is the one I recommend – other brands dried out on their own over time. Dip a yucky brush into dishwashing liquid to coat it before using masking fluid – makes it a lot easier to wash off right away. Three-tiered brush washer for dirty, less dirty, and clean water. Albrecht Durer pencils – Very nice artist quality pencils! I have the full set. Yum. Caran d’Ache Museum Aquarelle pencils – Superb in quality, both intense color and application. Inktense pencils – these are an ink, so they dry permanently. I store pencils in cases like this one. Sharpener: I’ve found THIS one and love it! There are so many water-based/water-soluble pens out there. Use what you have! Please don’t feel you “need” a new set just because it’s the latest rage. These are listed in price order, lowest to highest – and as always, the higher end markers tend to gain best results. Marvy LePlume II – A mix of colors, more realistic than vibrant; easily soluble with water on watercolor paper. Brush nib plus a SUPER TINY bullet nib that I love. 108 colors. Tombow – A mix of vibrant and dull colors; easily soluble with water on watercolor paper. Brush and bullet nibs. 96 colors. Zig Clean Color – Very vibrant colors; single nib is an actual brush nib. Works on watercolor paper with water (they run quickly with water – and some change color entirely when mixed with water.) But these also color fairly well on some non-watercolor papers. Great for coloring books. 80 colors. Ranger Distress Markers – Great for a variety of techniques, but not terribly soluble when applied directly to paper – palette use almost always helpful. 60(ish) colors and always being added to. Some watercolor techniques are best achieved with pens rather than brushes and a palette. But don’t forget you can apply watercolor markers direct to stamps as well as scribble on a palette! Watercolor powders have been around for decades – and are so much fun! See this post for more info than you could stand on the powders – including some buying tips and comparisons to help you get started. Brusho is my preference – they’ve been around for over 25 years. It is artist quality pigment, comes in 34 colors (2 just added), and retains a beautiful granular quality. Trimmer – Guillotine is my favorite! Detail Scissors – Love these for detail work. Craft Asssistant – the black shiny 12×12 metal plate you see in my videos. Cleans up great, and magnetic masking material sticks to it! Tim Holtz Glass Mat – large, heavy, and has several areas for working, mixing, etc. Cleans up great – not magnetic. ; but I haven’t decided if I’m ok with the black and white grid, it’s a little visually confusing to me. Acrylic blocks love the soft curved edges on these for stamping and tiny block set for AI watercolor. Crazy huge category! Agh! #iloveallthestamps…here are just a few of my favorite companies. In alpha order so I don’t have to pick favorites, LOL! Compensated affiliate links may used. Read more. There’s an entire site for my book filled with info – look for the Buyers Guides for both Bibles and art supplies. Camera: I shoot on a Canon EOS Rebel T5i . Editing software: I edit in Final Cut Pro. Tripod: I love the Mobile Grip 2 for my car, and Kitchen Desk Table Stand in the studio for live broadcasting – and with the ball adaptor, it works with my camera as well as my phone. Use coupon code sandyallnock to get 20% off any purchases at Arkon.